001: This gorgeous smock top is dainty and could be worn with jeans/leggings or tucked into a nice skirt! A bold necklace would look great with this look too. At £38 it's pricey but with student discount it brings it down. Get it here. 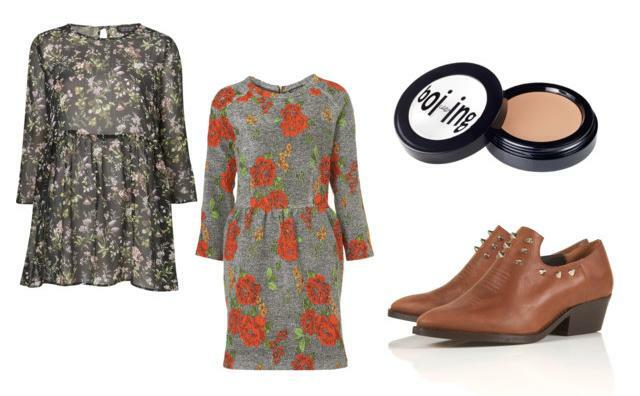 002: A lovely print dress is perfect for winter with some wooly tights, a big coat and hat! Some gloves like this could go well. You can get this dress from here. 003: I'm in need of a new concealer that I can put in my bag and carry around. From reading great reviews I think this will be my next make up purchase. It's more than I'd usually spend on concealer but from what I've heard it's a must! Get it here. 004: Aaah! These boots are just perfect, jeans/skirt/dress whatever the occasion these will look yummy. They're not a bad price either at £72 which is cheaper than some other sites. Also with the discount it will bring it down! You can get them here. Myunidays is a fantastic place to find student discounts so if you haven't already signed up I suggest you take a look, you can save at ASOS, french connection, urban outfitters, topshop, waterstones, motelrocks and many more!! I've heard good reviews about the boi-ing concealer, I'm thinking about getting it because I can't find a concealer that gives enough coverage under my eyes :(. I love boi-ing concealer, it's one of my favourites. Definitely worth a go! Lovely blog, feel free to come and say hi, I'd really like to meet some more bloggers!